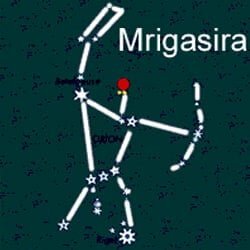 The 4th Nakshatra in Jyotish, Mrigasira is symbolized in the constellation Orion by the three stars that form the celestial huntsman’s head. Mrigashira, the head of a deer, is ruled by the Moon (Chandra) is personified in the Orion constellation by the group of three stars that form the head of the celestial huntsman. It is said that Orion was the sky god and like his ruler the Moon, he became obsessed with Brahma’s beautiful daughter Rohini. The hunter chased Rohini across the cosmos changing shapes throughout the pursuit. At some point he took on the appearance of an antelope (or head of a deer, now the symbol for the Nakshatra) and was shot with Brahman’s arrow. Orion fell to the earth and the unity of the Universe was split. Drawn to natural beauty and the exploration of nature, Mrigasira birth star people are capable of immense love, particularly for their mothers. Like Orion’s eternal quest for Rohini, these individuals are ever vigilant in their search: although they might not actually know for what they are searching. 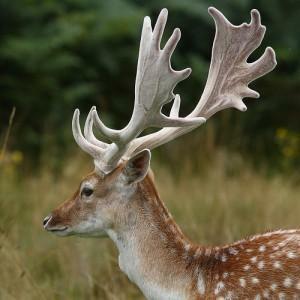 They can be restless, nervous and nomadic individuals. Their propensity for collecting and the on-going quest for their next best treasure soothes them and gives them a purpose for their quest. They love to shop and have trouble managing money effectively. Collecting also feeds their need for knowledge, love of research and provides them with a mystery to investigate. For some highly developed Mrigasira their quest will lead them on a spiritual path. They are known for having beautiful children and a good sense of humor. Like their symbol the antelope, these are gentle, peaceful creatures with large, soft doe-like eyes. Mrigasira are known for their fine body structure, are generally tall and have relatively thin legs. The native of Mrigasira has high morals, good intellect and an infectious personality according to Vedic astrology. They are known to be sincere with the ability to see both sides of the story. Affectionate and warm hearted, they trust easily and may admire people who don’t really deserve their adoration. They may be easily betrayed in business and need to be cautious about who they do business with and who they choose for friends. They put up a courageous front and are known to be spontaneous risk-takers. At heart they are very timid and prefer to avoid conflict. Generally unstable and restless they will confront injustice head on and tend to be easily annoyed. The split unity represented by this Nakshatra leaves many a Mrigasira lacking in peace of mind. Middle age can sometimes bring some sense of stability to their lives. Sensitive and fragile: intellectual and intelligent. These beings are bestowed with prosperity, respect and a certain ease around others. They are quick to judge, may become aggressive when challenged and do not easily forgive. Perceived as successful, their split consciousness makes it difficult for the individual to retain accumulated wealth and material objects and they are known to make foolish mistakes that leave them in financial and professional ruin. Intelligent people, they are easily bored and have difficulty finishing what they start; as such they will be employed in a range of professions over the course of their lifetime. The native Mrigasira are truly attached to their family members and show a great deal of love and admiration for those they are close too. Sadly, they are often misunderstood and generally don’t receive the love and attention they so crave. Their love lives tend to be complex and marriages may be short lived. Plagued by childhood ailments, the native is prone to digestive problems, stomach disorders and shoulder injuries.